To provide the best USC experience through chef-driven, flavor forward menus. We aim to provide craveable, healthy and socially responsible cuisine for the Trojan Family. Our chefs constantly strive for the elevation of culinary strategy as a nutritional advantage. We meet guests’ needs of the present without compromising the ability of future generations to meet their own needs. Click here to download and print. 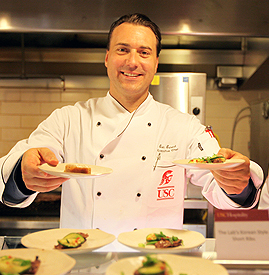 With over 900 team members, USC Hospitality is one of the largest employers on campus. As the university grows, so do we. As such, we frequently have opportunities for qualified candidates with experience in the food service and hospitality industry. We are supported for Local 11 and are team members are active and responsible members of the Trojan Family. Interested in learning more, please click on the link below.